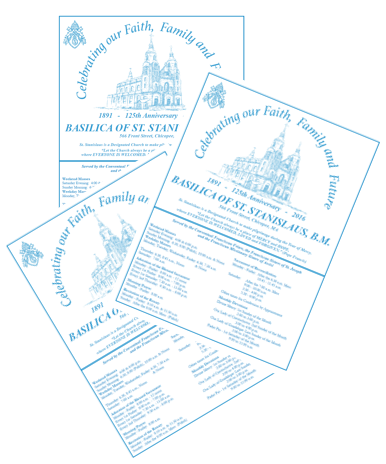 Gift of the St. Stanislaus Bishop and Martyr Society. 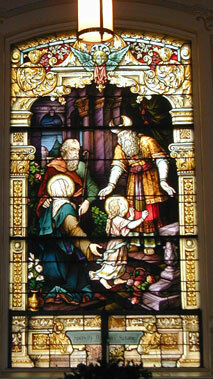 Melchizedek, King of Salem and priest of the most High God, met Abram upon Abram’s victorious return from battle. Melchizedek brought bread and wine and blessed Abram. Abram, in turn gave tithes. 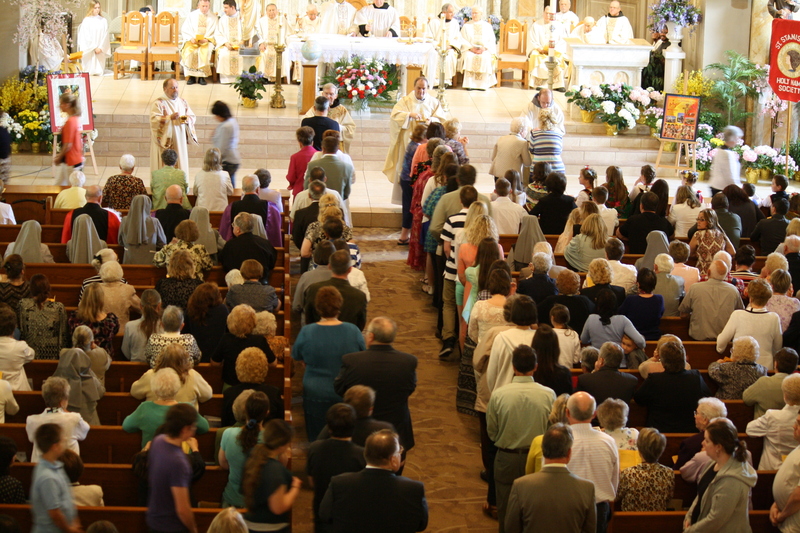 In these events, there is an allusion to the Eucharist. Gift of Alexander and Zofia Czapran. 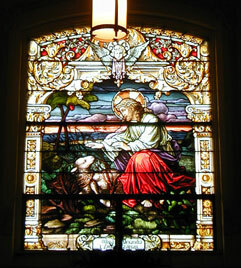 This window portrays the biblical image of Jesus as the Good Shepherd who goes in search of the lost sheep of his flock. The good shepherd of a flock of one hundred sheep left ninety-nine sheep and searched in the mountain for the one lost sheep. When he found his one lost sheep, he rejoiced over it more than over the ninety-nine that did not wander away. Gift of Third Order of Secular Franciscans. The Incarnation of Christ shows God’s poverty. The Creator becomes the creature because of poverty and dwells with the poor and ordinary people, symbolized by the shepherds. There was no room in the inn in Bethlehem, so when Christ was born His Mother wrapped Him in swaddling clothes and laid him in a manger. An angel appeared to the shepherds in the fields to announce the good news. 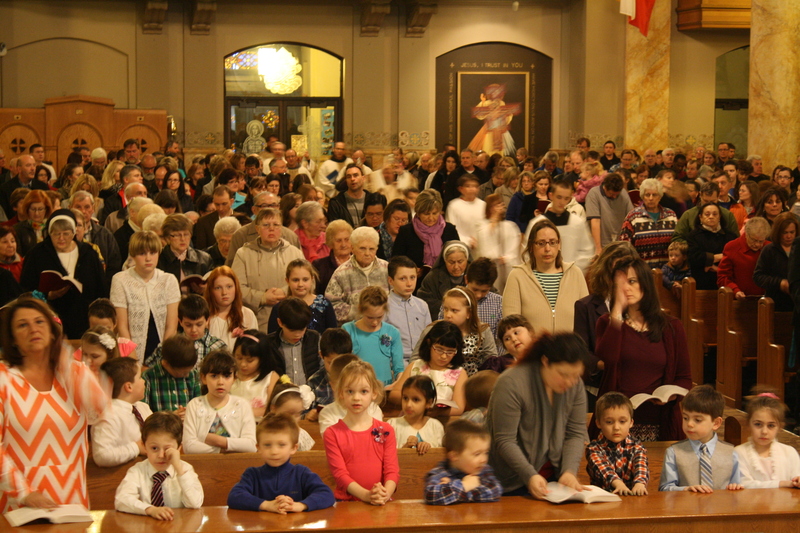 The shepherds let their fields to pay homage to the Infant Jesus, Mary, and Joseph. Gift of the School Children. Presentation in the Temple. 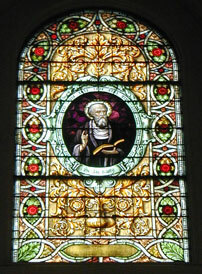 Two theses can be attributed to this stained-glass window. One thesis, the Presentation of Samuel in the Temple, can be traced to Scripture while the other thesis, the Presentation of Mary in the Temple, has its basis in the Apocryphal Gospels in which many stories are related about the Blessed Virgin Mary. A. Presentation of Samuel in the Temple. Anna, the wife of Elcana, was barren. She prayed to the Lord that she be blessed with a child and vowed to offer this child to the service of God. When her prayers were answered and she bore a son, she named him Samuel. 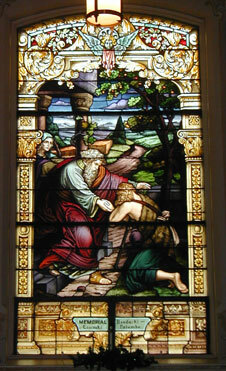 When Samuel was a small child, he was presented in the Temple and offered to the service of God. Samuel became a famous judge and prophet. B. 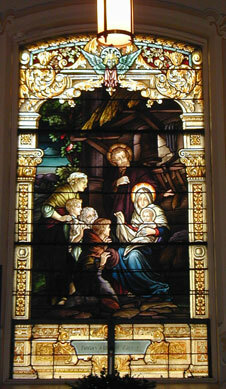 Presentation of Mary in the Temple. Before Mary was born, Mary’s mother vowed that if she were blessed with a child, she would dedicate her child to the service of God. Mary was born when her parents, Joachim and Anna, were elderly. Mary’s mother kept her promise and presented Mary in the Temple when Mary was a small child. Mary remained in the Temple until her betrothal to Joseph. 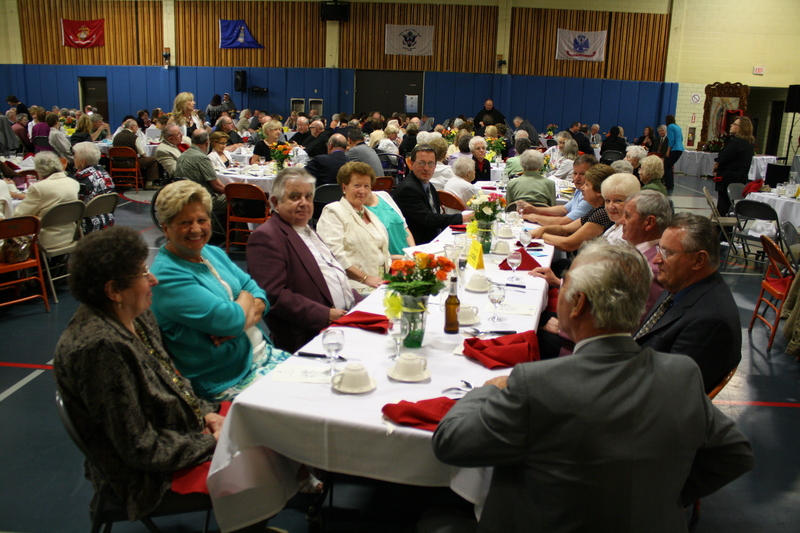 Gift of the Brodacki, Lozinski and Palumbo Families. 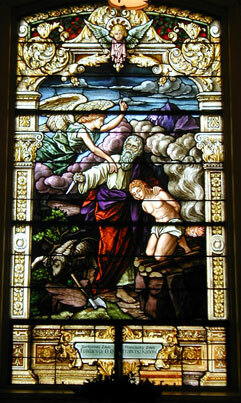 This window shows the parable of God’s forgiveness in the Gospel of Luke. The Franciscans preach the Gospel of Forgiveness and Reconciliation with God. The younger of the two sons took his share of wealth from his father, left his father’s home and squandered his fortune. To eke out a living, he worked as a hired hand feeding swine on a farm. He repented and returned to his father’s house to ask for his father’s forgiveness. Upon seeing the returning prodigal son, the father rejoiced, welcomed him, and prepared a feast for him. The elder son was angered by the reception given to the younger son. The father assured his elder son that since the elder son had remained faithful and had worked with the father, all that the father owned also belonged to the elder son. They were to rejoice, however, because the lost had been found. 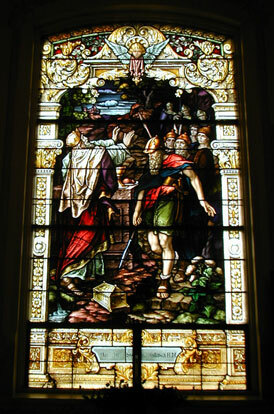 This window depicts the Old Testament patriarch, Abraham. Obedient and faithful to God’s orders took his only son, Isaac, to offer Isaac for an holocaust on the mountain. As Abraham drew his sword to sacrifice his only son on the altar that he had prepared, an angel called to him and told him not to lay a hand on his son. As Abraham looked up, he saw a ram in a thorny bush. He took the ram and sacrificed it on the altar instead of his son. God had tested Abraham and found Abraham ready to sacrifice his only son. God blessed Abraham. In these events there is an allusion to the sacrifice of Jesus Christ. Gift of Vincent and Frances Krason Family. A man on his way to Jericho from Jerusalem was attacked by thieves who stole everything he had and beat him severely. A priest and a Levite saw him, but neither helped. A Samaritan, who also saw him, was moved with compassion. He stopped, dressed the man’s wounds, put the man on his beast, brought the man to the inn, instructed the innkeeper to care for the wounded man, gave some money to the innkeeper for the care of wounded man and stated that on his way back he would compensate the innkeeper for any additional expenses. Gift of the Lowinski Family. After Jesus had eaten with the Apostles and had taught them, He led them toward Bethany. He informed them that they would receive power when the Holy Spirit came upon them. He blessed them and then ascended into heaven. 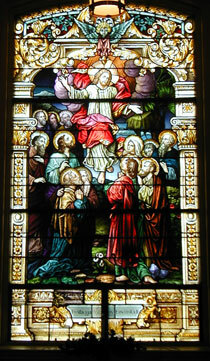 The ascension and glorification of Jesus is viewed by the Franciscans as the crowning of Jesus’ life of poverty and humility by God the Father. The coronation of Mary is the reward of her poverty. She was the poor woman open to the workings of the Holy Spirit in her life. Gift of Paul and Antonina Starzyk. 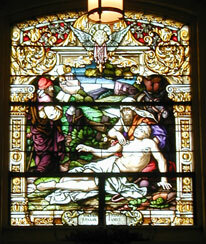 This window portrays the Gospel story of Penance and Repentance. The woman, a sinner, washes the feet of the master. This forms a Scripture basis for the Franciscan call to penance. When Jesus was dining in the house of one of the Pharisees, a townswoman who was a sinner bathes His feet with her tears, dried them with her hair, kissed them, and anointed them with ointment. One of Jesus’ disciples, Judas Iscariot, decried the use of the ointment for the anointing of Jesus’ feet. He contended that the ointment should have been sold and the proceeds given to the poor. Jesus responded that she did a good deed, that there would always be poor amongst them, but that He, Jesus, would not always be in their midst. 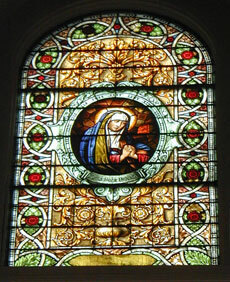 The window portrays the Sorrowful Mother Mary and is opposite the picture of the Suffering Christ. Mater Dolorosa. Seven sorrows are associated with our Lady of Sorrows. 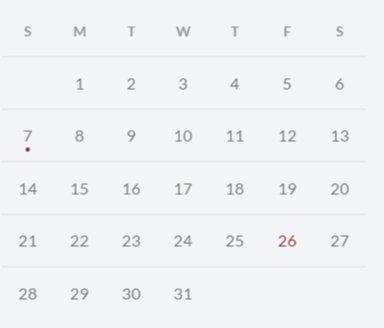 The sorrows are in the order of their occurrence: 1) Prophecy of Simeon, 2) Flight into Egypt, 3) Disappearance of the child Jesus for three days, 4) Way of the Cross, 5) Crucifixion, 6) Death of Jesus, and 7) Burial. Blessed Bronislawa. (1203-1259). Blessed Bronislawa was the only daughter of wealthy parents. 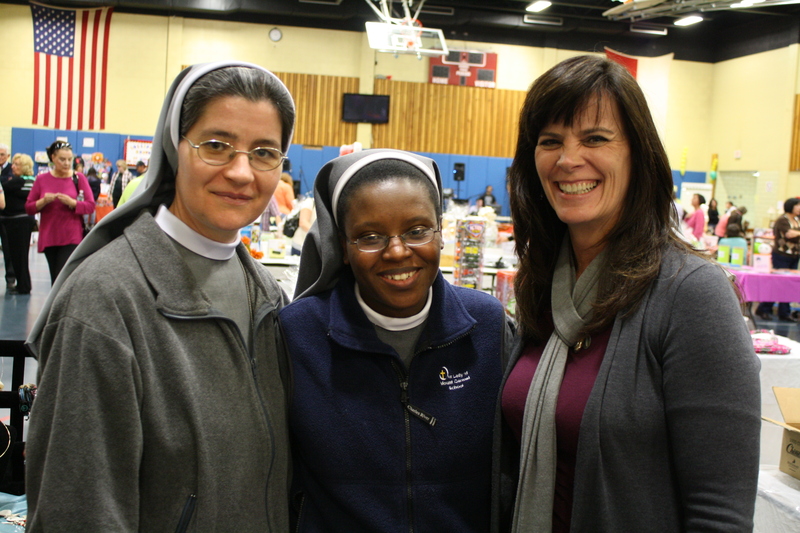 She became a Norbentine nun and lived a life of humility and mortification. As a contemplative nun, she lived as a solitary in a cave near the Monastery. Her thoughts were focused on Christ Crucified. She was a cousin of St. Hyacinth. 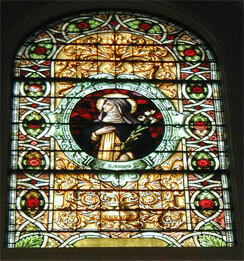 Blessed Salomea. (1202-1268). Blessed Salomea was born in Cracow. She married Prince Coloman of Hungary. Each lived a life of celibacy. She lived like a religious. She became a Franciscan Tertiary. Upon her husband’s death on the battlefield with the Tartars, Salomea gave her riches to charity and returned to Poland. She entered the Convent of Poor Clares where she spent a number of years. 2. St. Hedwig. (Sw. Jadwiga) (1174-1243). 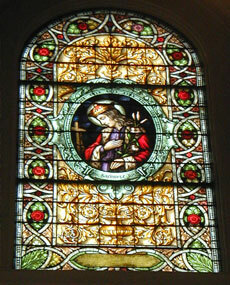 St. Hedwig married Duke Henry when she was twelve. 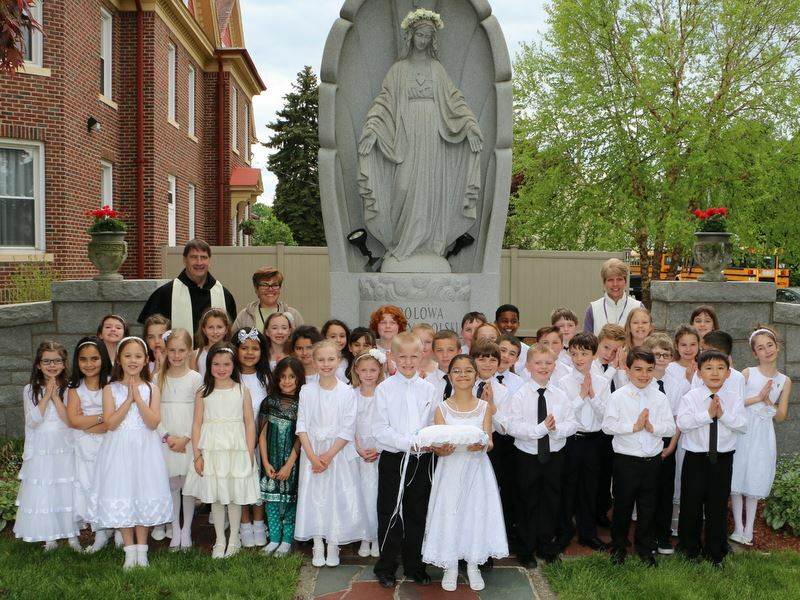 They were blessed with at least six children who were brought up in an exemplary manner. She, herself, lived a simple and austere life: but she was always generous to those in need. She endowed hospitals, orphanages, and homes for the aged. In response to St. Hedwig’s wishes and request, Duke Henry built a monastery for nuns at Trzebnica. Upon the death of Duke Henry, she moved into the Monastery at Trzebnica. Many miracles are attributed to her. Blessed Cunegunda. (B. Kunegunda) (1224-1292). Blessed Cunegunda is affectionately called Kinga. After the Tartars defeated King Boleslaus II, they retreated to the Volga River. Upon their retreat, Kinga, her husband, Boleslaus the Chate, (Both Kinga and the King had taken vows of perpetual chastity) and St. Hyacinth took upon themselves the task of rebuilding Poland. Their endeavors helped Poland to rise from ruin in a relatively short period of time. Upon King Boleslaus’ death Kinga was offered the “Crown” which she refused to accept. Later in her life she entered the Convent of the Poor Clares where she lived a life of austerity, a life which she devoted to helping the poor. 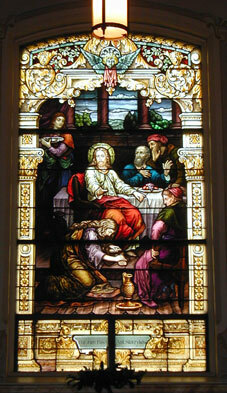 This window depicts the suffering Christ. “Ecce Homo” is translated as, Behold the Man. Ecce Homo is one of the famous paintings depicting the Passion of Christ. Pilate had found no guilt in Jesus Christ. When Jesus appeared before the people wearing a crown of thorns and a purple robe, Pilate said, “Behold, the Man. St. Adalbert. (SW. Wojciech) (939-997). 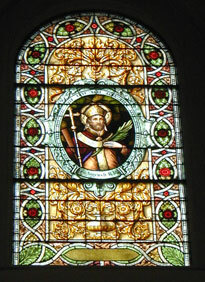 St. Adalbert was born of a noble family in Bohemia. He became Archbishop of Prague at a young age. The discord in Bohemia prompted him to leave Prague and to become a Benedictine monk in Rome. He left the Monastery to become a missionary. His objective was to convert pagans. He traveled to Poland and Hungary. When St. Adalbert, a holy man, and two companions attempted to evangelize in Prussia, they were regarded as spies and were murdered. Thus St. Adalbert became a martyr. 3. St. Casimir. (Sw. Kazimierz) (1458-1484). St. Casimir was born in the Royal Castle in Cracow, the third of thirteen children. He was taught by the famous historian, John Dlugosz. 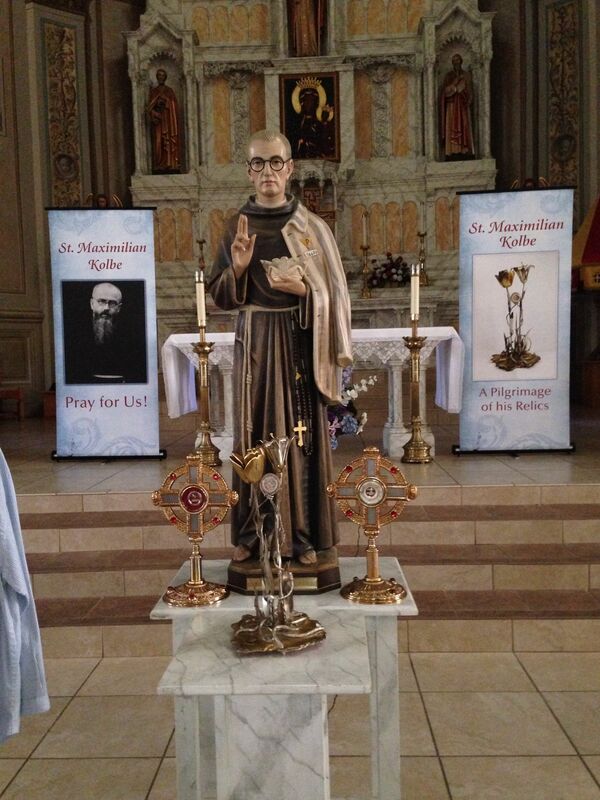 From an early age, he devoted his life to holiness, austerity, and charity. He refused to lead an army against the King of Hungary in order to seize the Hungarian throne. His ascetic life exacerbated his lung condition. 2. 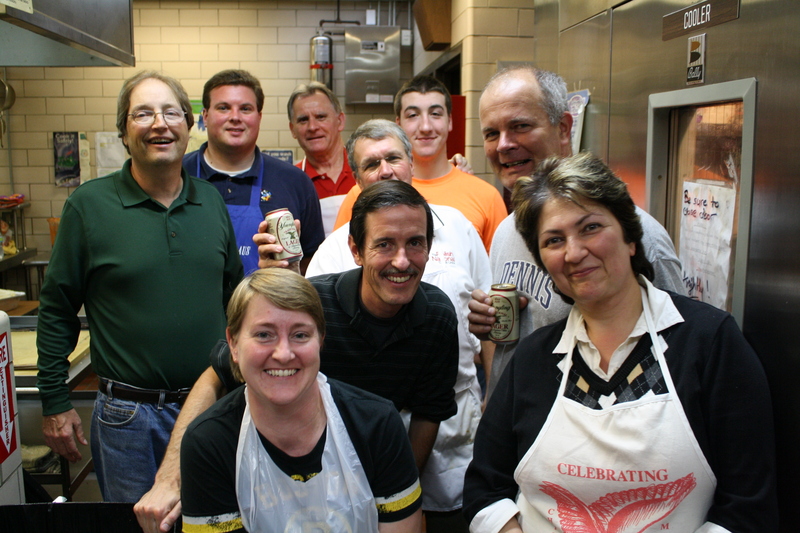 St. John Cantius. (Sw. Jan Kanty) (1390-1473). St. John Cantius was educated at the University of Cracow. 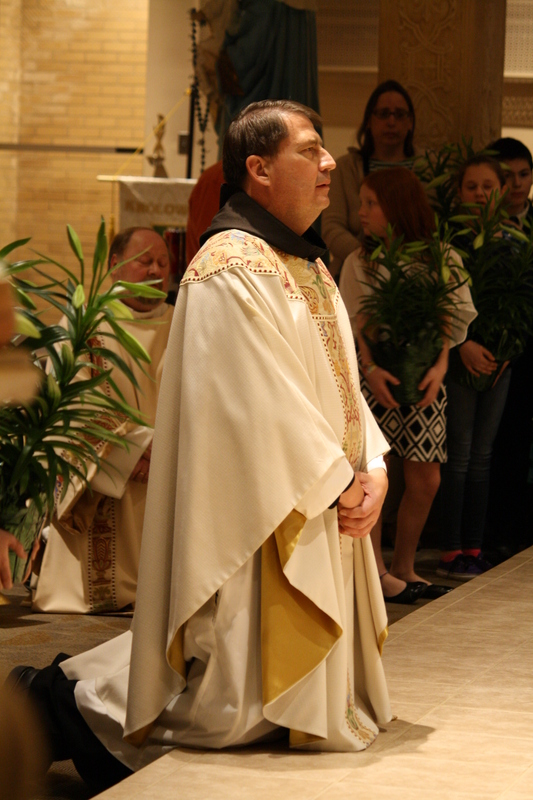 Upon his ordination, he was named a lecturer in Scripture. 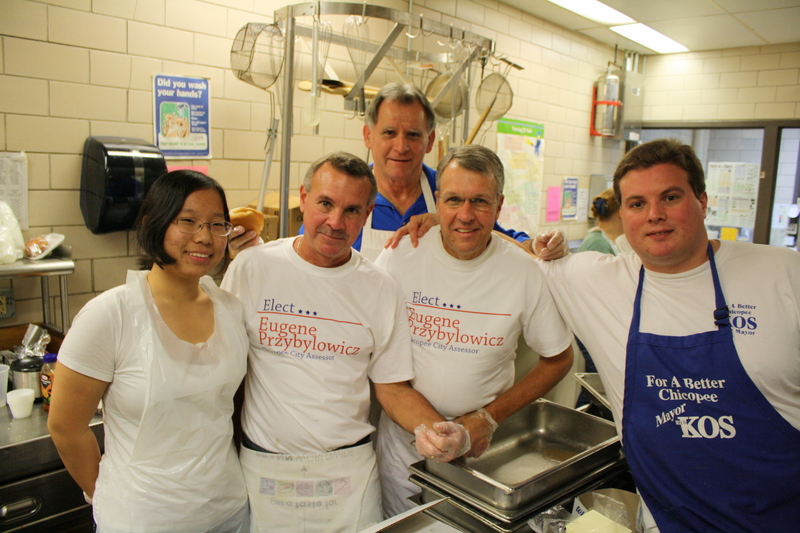 After a short stint as a parish priest, he returned to the University of Cracow as a Professor of Scripture. He was well known for his preaching ability, his scholarship, piety, and austerity in his way of life. He was also noted for his compassion for the poor. St. Stanislaus, Kostka. 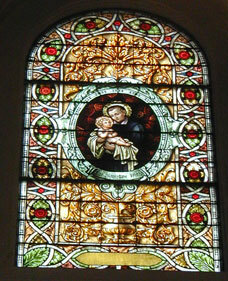 St. Stanislaus Kostka (1550-1568), the patron saint of youth, received his early education from private tutors. He was sent to Vienna for further studies. During an illness, he had some visions in which the Blessed Virgin Mary appeared and enjoined him to devote his life to God and to enter the Society of Jesus. Despite his father’s opposition, he journeyed to Rome where he entered the Jesuit Order. He led a life of great sanctity, piety, and mortification. During his short life, he was an inspiration to many. 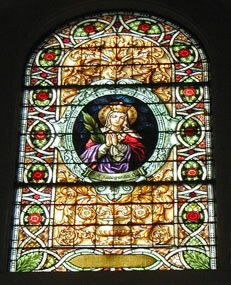 The stained-glass window on the choir shows St. Cecilia, the patron of music and Musicians. 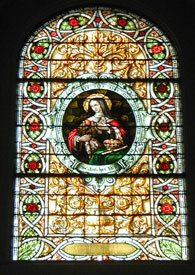 St. Cecelia, the patron saint of Music, facing the organ console and the sanctuary. 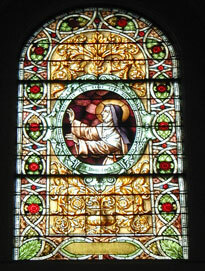 According to legend, St. Cecelia invented the organ and could play any musical instrument. 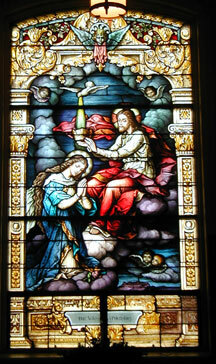 Some of the most exquisite stained-glass windows, the work of talented European artists, grace the basilica. 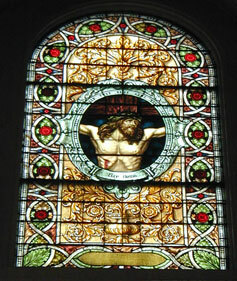 Each stained-glass window, and there are many, has its own theme. Click on the numbers above to view the window and see a description. In the sanctuary at the summit of the apse is located a beautiful round stained-glass window which depicts the Immaculate Heart of Mary. In the vestibule to the right and left of the main entrance are two identical stained-glass windows which depict the Coat of Arms of the Franciscan Order—the cross as a symbol of Redemption and the crossed hands of the Lord and St. Francis of Assisi. 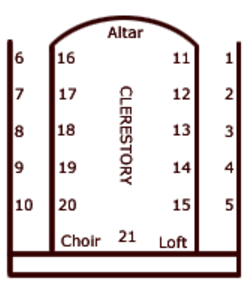 On each of the outer walls of the staircases leading to the choir loft is found a stained-glass window which symbolizes the Holy Trinity. The window depicts an eye with a beam emanating from it set within a triangle. Six stained-glass windows, the last ones to be installed, depict the Sacraments and are located in the sacristies and back corridor of the church. 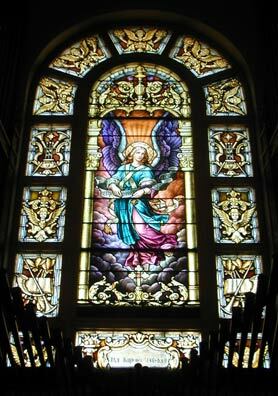 The style of the new stained-glass windows differs considerably from that of the early stained-glass windows in the church.